The Book of Psalms may be the best loved and most misunderstood book of the Bible. Found within the pages of this wonderful, inspired book of the Bible are words of comfort, encouragement, and peace, but many readers miss mining out some of the real spiritual gems because they simply don’t understand this unique and ancient Jewish genre called wisdom literature. Dr. Tim Riordan offers the Reading the Bible series as a resource to help people understand and apply to the Bible to their lives. 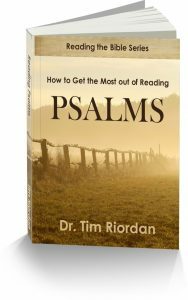 How to Get the Most out of Reading Psalms will give you greater insight into this beloved book, and you will find yourself returning often to this resource as a spiritual guide for your life. If you would like a free copy of this helpful resource, click the button below where you will be directed to your free book.